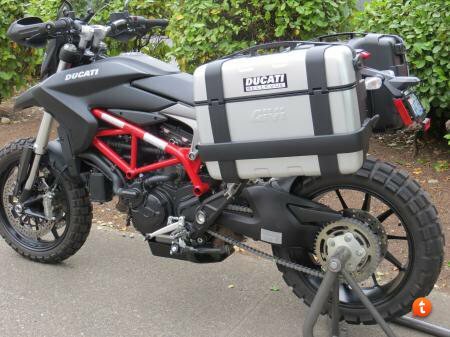 Measurements on the Hyperstrada Panniers? Guys, currently thinking of a going for a '13 Hyperstrada over standard or even SP given the acutal functionality of the 'strada accessories. Key question which I neglected to do at the dealership, so if someone could please take: Internal measurements of the panniers - length - width and height. 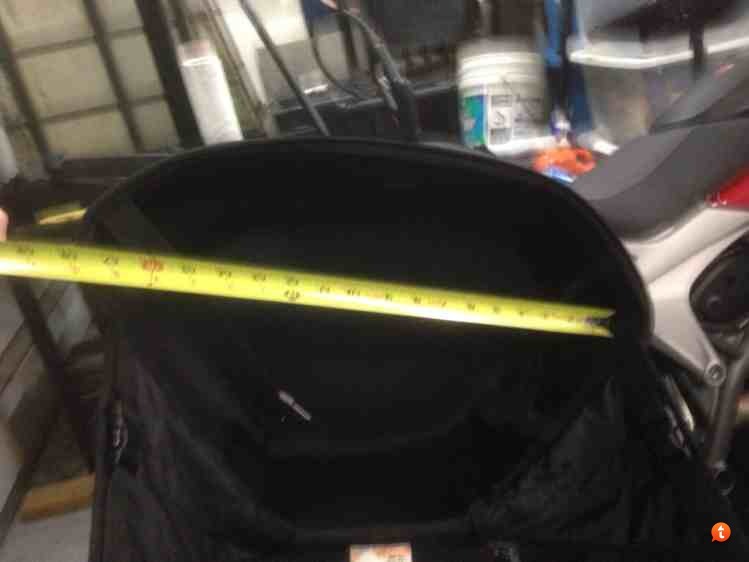 Trying to figure out what actual fits, a full face helmet -- a small briefcase etc. I am hoping to avoid the need for a dedicated top box as I don't like that look. I stuff my full face AGV Horizon- with rear spoiler- in my panniers daily. It only fits upside down and is tight fit, but works. I'm sure these will post upside down (they always do from my phone) but as you can see, the full-face fits. That's even with my communicator still hanging on the side of the helmet. And yes, they will close all of the way. Guys appreciate the follow and that does help the cause - so full face helmets are Ok - how about length and height - just looking at what bag will fit inside? Thanks. I'll go measure in a bit, but I can say that one of my disappointments with the 'Strada is that while the bag volume is fine, it's the shape that's all wrong. None of my work provided laptop bags will fit. 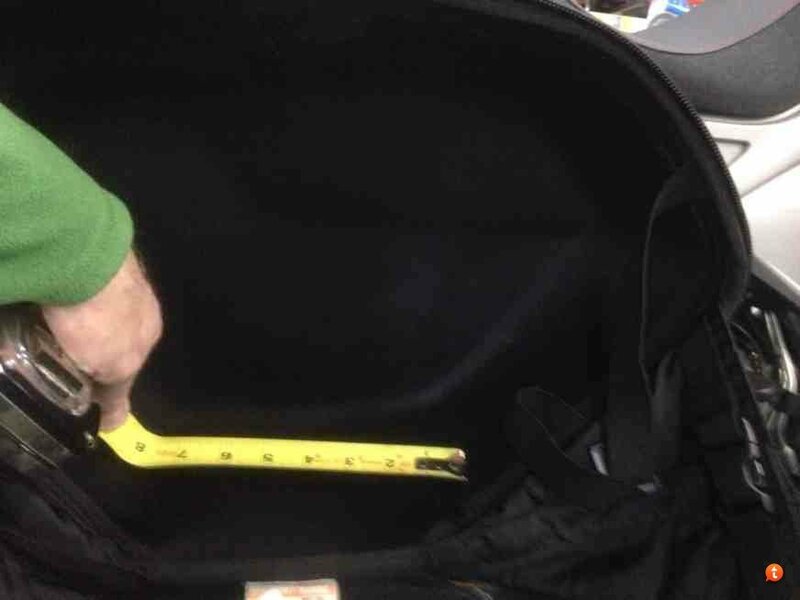 The diagonal measurement doesn't work with the angled back-facing side of the bag. I was at the Euro Moto show here yesterday and looked long and hard at Bellevue Ducati's custom Givi setup on their Hyperstrada. They machine a custom adapter plate that converts the three point Ducati bag mount to whatever the standard Givi mount is. Lemme see if I can find pics. Seemed pretty slick to me, if a little pricey for an aluminum plate with holes in it. Last edited by porkrind; March 2nd, 2014 at 08:02 AM. 12 inches top to bottom. 17 inches front to back, 10 inches wide. The front to back measurement is misleading, as the bag is roughly diamond shaped, and tapers a bunch toward the bottom. 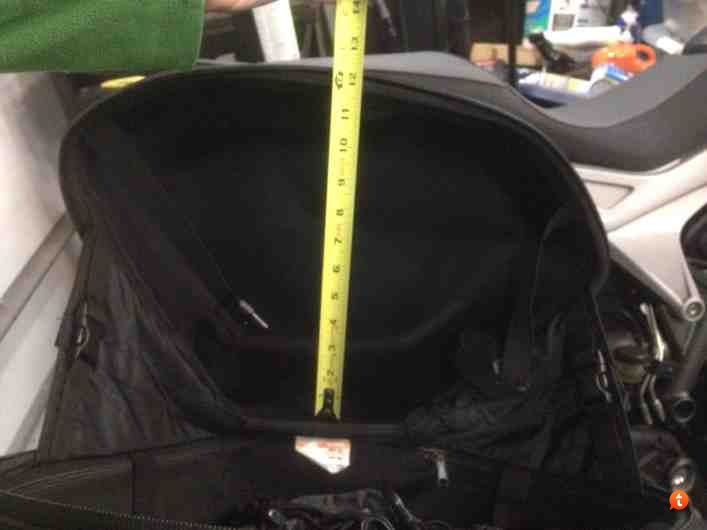 The bag is only about 7 inches front to back at the bottom. Awesome and thank you for the help there - to your point it looks like my saddleback leather briefcase would totally not fit - the shape is just for general purpose business bags - will have to think that option over.